If you, like me, are an evil dungeon master, you will love Dungeons & Dragons adventure Dead in Thay’s map. If you are a mascochistic D&D player who loves getting trapped in fiery pits with ferocious liches, you will also love it. 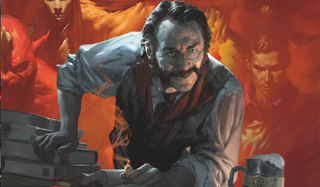 Dead in Thay is one of the seven revamped adventures in upcoming D&D book Tales from the Yawning Portal, which will be released on April 4th. In the adventure, the Red Wizard Kazit Gul lures adventurers into his Doomvault, a sprawling and comically nefarious dungeon. It has over 100 rooms. In many of them are oozes, traps and intelligent monsters, like beholders and vampires. It is a creation of pure evil and it is an inspiration. Where to start—perhaps take a tour of the Golem Laboratories or the Phylactery Vault? Traipse around the Forest of Weakness or take a dip in the Predator Pools? Get a load of those spiky rooms full of huge boulders! Or the bloody whirlpools with stone pillars! You could bash your brains out on one of those. The map is an updated version of the older Doomvault map, released as a part of Dead in Thay’s 2014 incarnation for the D&D Adventurer’s League. In it, a dungeon master ran several groups of players at once. It was a classic “mad wizard” map that Wizards of the Coast revamped for wider appeal. Cleaned up with movement squares and a key, 2017's Doomvault map looks great. I can’t wait to run players through it. Any volunteers?